So I needed another baby quilt for someone at work. 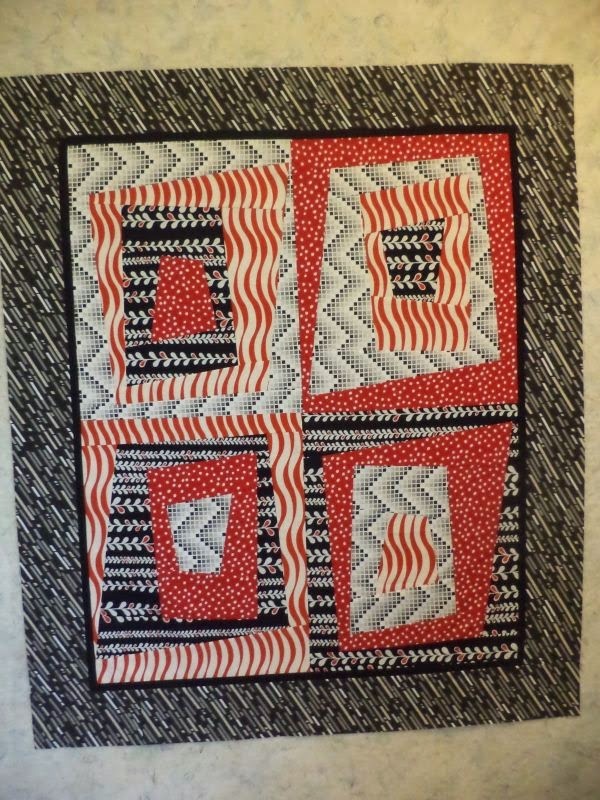 I decided to make this one from 4 fat quarters, because if I don't take too much out with seam allowance that ought to come up to almost 1 yard (36" x 44"). 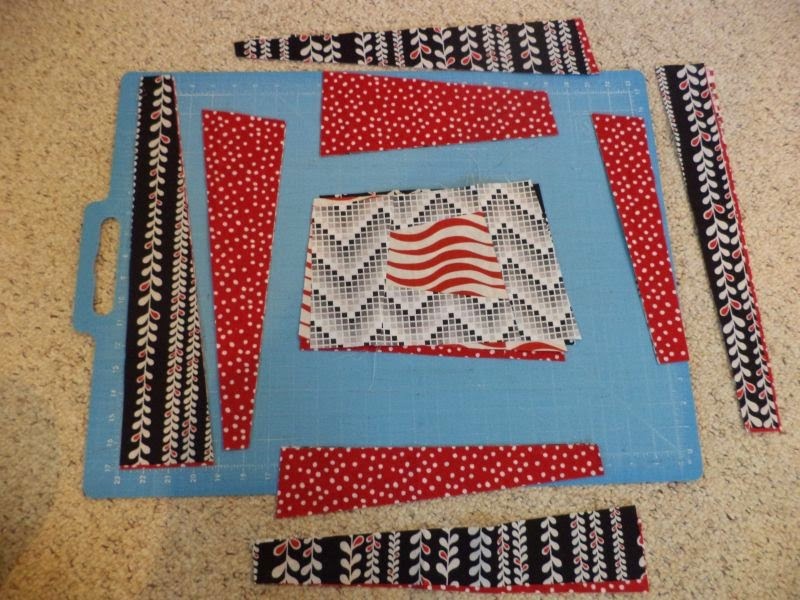 I'm going to outline quick a tutorial here, so you can make a baby quilt with just 4 fat quarters and a little border fabric! I used the same technique as for the square in square blocks my do. Good Stitches group did, just on a larger scale. 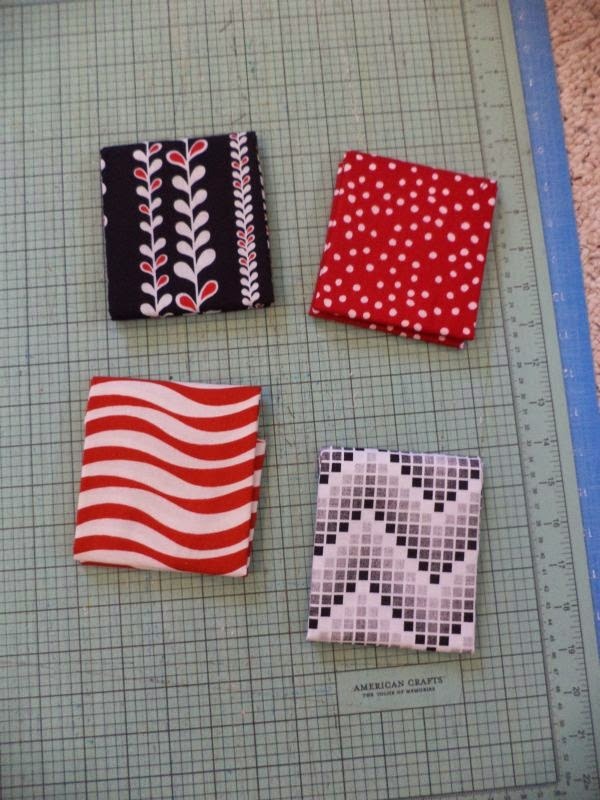 Get yourself 4 coordinating fat quarters, it's best if they all play well next to one another. Press the FQs and stack them up. They won't be the same size, but try to line up one edge. It helps to trim them square to the same size a this point, but it's not strictly necessary. Start making cuts, first from the right and left, then from the top and bottom. 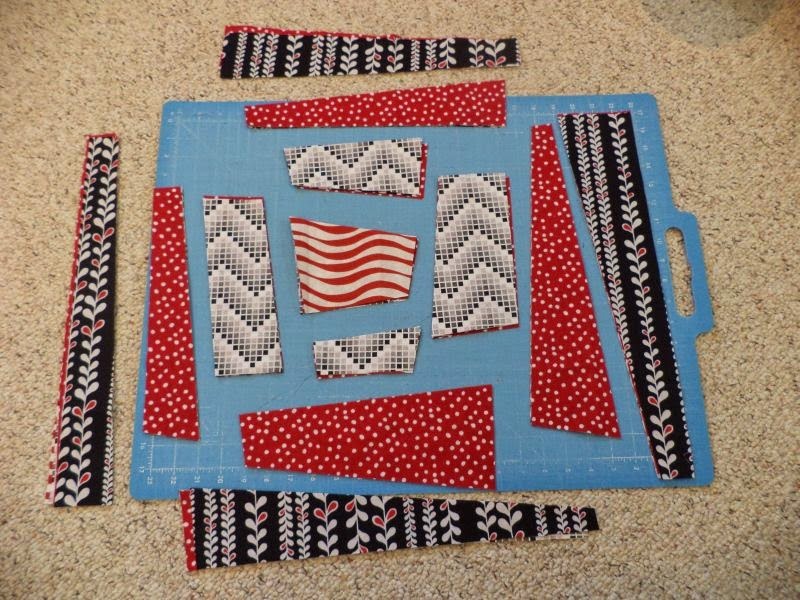 Then repeat with the fabric block remaining. I made mine wonky, but you could make yours straight. As you make each cut push that piece to the side but leave them all in position. Keep cutting until you've cut 3 rounds. From the center block move the top 2 pieces of fabric to the bottom of the stack. On all 4 pieces in the second round move the top piece of fabric to the bottom of the stack. Leave the third round alone. In the outside round move the piece on the very bottom to the top of the stack. Now you have your four block laid out, each layer is one block. 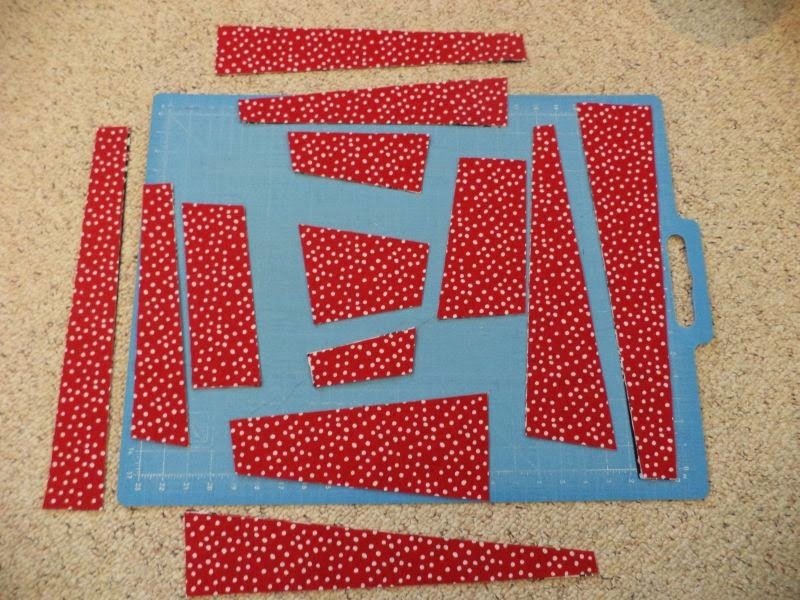 You sew them together in the opposite order you cut, starting in the center. Because of seam allowances you will have to press and trim after each pair is added. The most tedious part of this is keeping all the pieces in the right place and orientation as you sew. I recommend leaving them laid out on your sewing mat as you assemble. Once you get the blocks together each one will be about 3" smaller than the FQs your started with. If you are making them wonky you'll lose a bit more. Stack up the finished blocks and square them all up to the size of the smallest block. My blocks ended up at 14.25" x 17.5", so once sewn together the top was 28"x34.5". 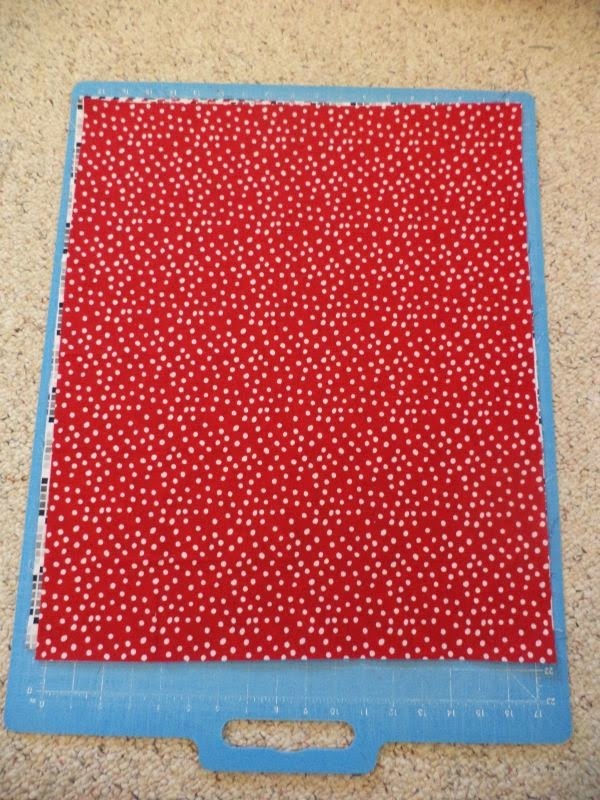 I chose to add borders to bring the size of the top up to 34"x42", just the right size to use 1 yd of fabric for backing. For a different look you could add sashing instead of borders. Ta-da! Linking to Design Wall Monday and WIP Wednesday. I'd love to see a picture if you make anything using one of my tutorials! Kat, I've been hopping and popping all over your blog. With all that you do, when in the world do you have the time to produce so much work? You are a dedicated sewist, girl! I love it. I have never seen improv simplified like you did it here, and it makes so much sense to me after having done it 'the other way'. I've seen the same method used for cutting curves down through a stack of 5 squares to make some luscious looking curvy pieced blocks, but this is really cool to see. 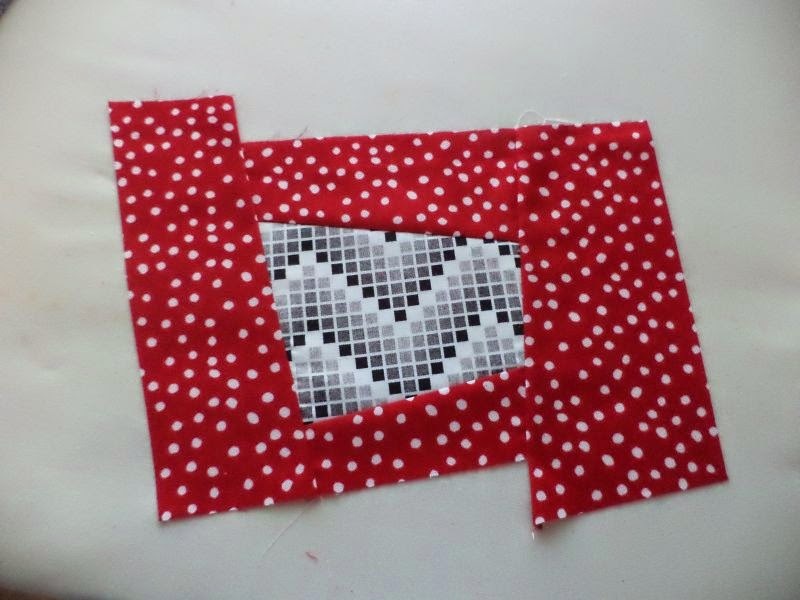 Backtracking a few years through your blogdom, I really like your take of the Bargello blocks, and again, I learned a few new tips. I need to frequent your page more often. You have solid content here. Love this! Looks great in your chosen fabrics too! You know, it's hard to find a wonky log cabin that I DON"T love. Your fabric choices make this one really stand out, however. Love it! 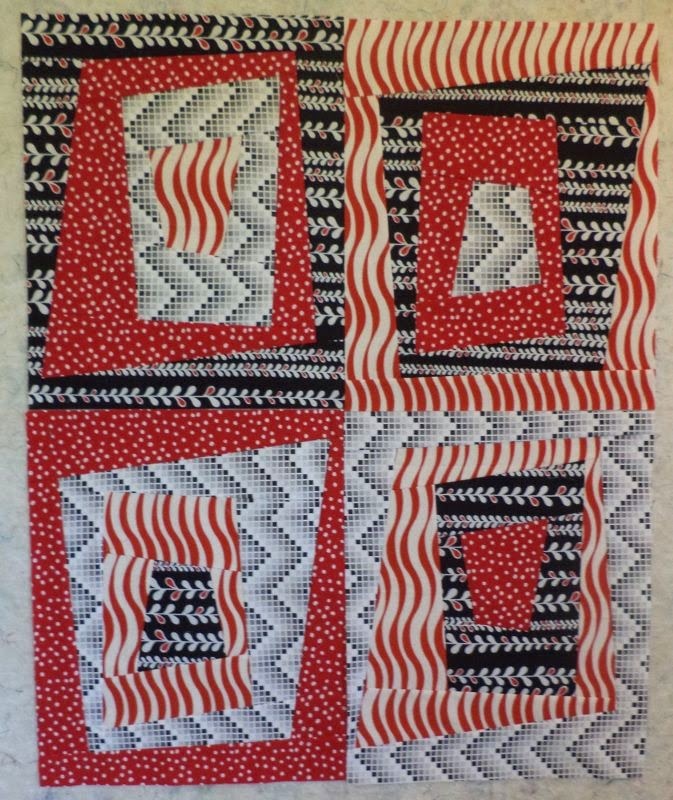 Perfect for a baby quilt! !